The bar-shaped text cursor, which looks like a capital letter I, indicates where the text you enter will appear within a Pages document. To enter text, simply begin typing. Your characters appear at the text cursor. To edit existing text in your Pages document, click the insertion cursor at any point in the text and drag the insertion cursor across the characters to highlight them. Type the replacement text, and Pages automatically replaces the existing characters with the ones you type. To delete text, click and drag across the characters to highlight them; then press Delete. Determine what to call your document. 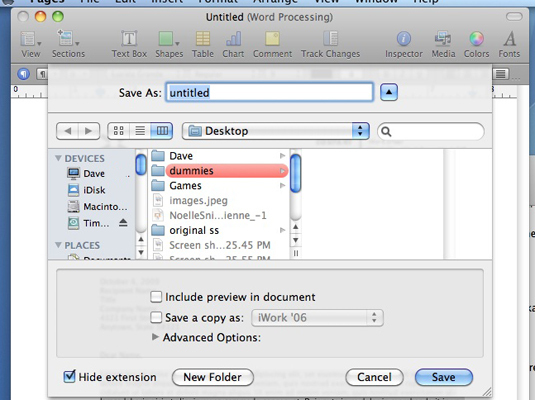 Click the Where pop-up menu and choose a location to save the document. Alternatively, click the button sporting the down arrow to expand the Save As sheet. This allows you to navigate to a different location, or to create a new folder to store this Pages project. 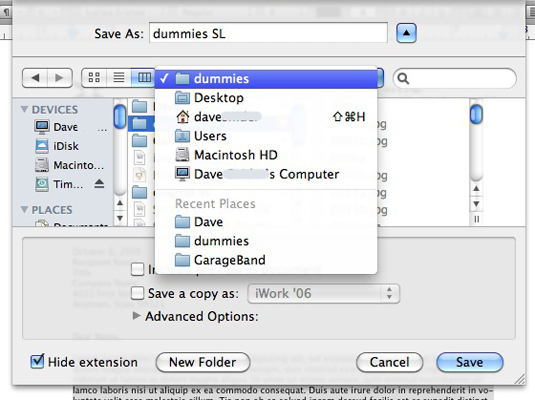 Determine where to save your document if you haven’t saved it before.